You can stay engaged throughout the Master Plan process by participating in our MindMixer Online Discussion. Topics change and updates on the plan progress will be posted for your review and comment. An extensive survey which asks a host of parks and recreational questions is available at Online Survey. Meetings with Local Interest Groups, March 11-13: The City of Paducah Parks & Recreation Department is seeking input from local interest groups who would like to add their experience and ideas to the development of the Paducah Parks & Recreation Master Plan. The professional consultants working to gather community input will be available to meet with local interest groups on the following dates: Monday, March 11 from 2 until 8 p.m.; Tuesday, March 12 from 10 a.m. until 7 p.m.; and Wednesday, March 13 from 10 a.m. until 3 p.m. Call the Paducah Parks & Recreation Department at 270-444-8508 to schedule your group’s appointment. 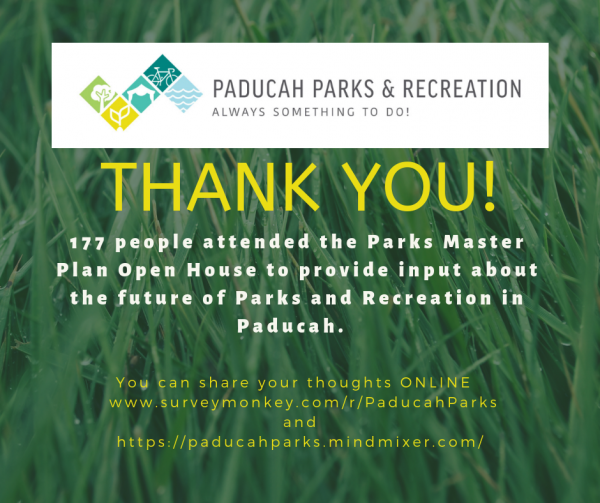 Open House on January 31, 2019: An open house was held January 31, 2019, from 6 until 8 p.m. at the Robert Cherry Civic Center which allowed the public to provide input in the development of the Paducah Parks & Recreation Master Plan and their thoughts on the future of the City of Paducah’s parks, facilities, recreation programs, community events, trails, and open spaces. The response was great with 177 people in attendance. In 2001, the City of Paducah contracted with consultant Brandstetter Carroll, Inc. for the development of the 2002 Parks Master Plan, a 206 page document. In 2008, the City contracted to amend the plan, 2008 Parks Master Plan Update.